Everything You Need to Know About Land Rush 2019! If you search for our festival with your GPS, you may get directed to our year-round office on Main Street in beautiful downtown Winfield. The festival itself is about 3/4ths of a mile west of downtown. Take 9th Avenue (US 160) west from downtown Winfield. The main entry gate is the western of the two entrances. The eastern entrance is for re-entry only (after you’ve gotten wristbands). 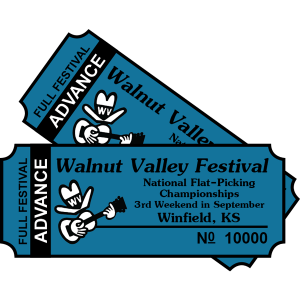 The Walnut Valley Association was formed in 1972, with its sole purpose to produce the Walnut Valley National Guitar Flat-Picking Championships Festival, also known as the Flat-Picking Championships, now known as the “Walnut Valley Festival” or simply “Winfield” to the long time attendees. Still the third week-end in September, in Winfield, Kansas, at the Winfield Fairgrounds, the Walnut Valley Festival has long prided itself on being educational as well as enjoyable, but most of all, the Festival is a homecoming. And a homecoming not just because of the music and how folks act, but a coming home to a place in the soul and the heart with a spirit of celebration. Do You Have Your Festival Tickets?